Empire Today ~ Im Just Sayin.. This post is just that a post to show that the company known as Empire Today is a scam! I have had many post and responses from pissed consumers of Empire Today. "The problem with this company is that they are so dishonest and have shielded themselves from unhappy customers by giving them the runaround. If you try to take them to small claims court, you have to make sure you have the exact name and address of the company you are trying to sue. But Empire Today has so many addresses, it's impossible to know which one is the correct one to use and if you had the wrong one, the case would be thrown out. There are so many complaints into so many BBB offices all across the country, but they close the cases as if they're settled when the consumer doesn't accept their offer. It's because, like Tom, they offer to replace the product at an additional cost to the consumer, (they want us to give them MORE money for another bad product and bad service) when it should be replaced under a warranty or because of poor installation or quality. So when the customer doesn't accept the offer (since no one wants to throw more good money after bad) the BBB closes the case saying Empire made an offer but the customer didn't accept it. They put bad quality products into your home, don't stand behind their products, don't return calls, don't have good installation teams, don't have good service, don't have next day installation....I don't know how they get away with advertising 'next day' when they never show up the next day, but make people wait 12 hrs. Attorney generals of the states Empire Today does business in, should look into the fraudulent sales practices of this company. I don't know when someone will shut them down. Maybe someone needs to notify the media and shine the light on this dishonest company." Review #165898 is a subjective opinion of User165898. I worked for the company for few years! That explains why NY market is constantly hiring new reps with training classes of 15-20 people and consistently averages out to have sixty sales reps! The installers are constantly scamming by charging miscellaneous charges on every job. Any local store can sell any grade flooring for half the price of empire and be more attentive to each costumer and have same warranty like any body else! I had a horrible experience with Empire just this past Saturday. You cannot defend an entire company, when you have salesmen coming to homes and making complete idiots of themselves and the company! I am waiting a call from someone with Empire about my experience. Some of you are ridiculous and need to be educated. Empire sells carpet made by Mohawk & Shaw, the two best carpet makers in the business! So to sit here and cry about the carpets they sale being inferior just shows your stupidity. Get a life morons and quit trying to ruin the reputation of a good company. Get a life you pathetic losers! I work out of the Detroit office and I have known most of the staff there for many years. They are very reliable. Not only do they take care of problem but they also call with follow up. Each one of the managers are on call with there cell phones on until 9:00 or later. We were trained that the customer is always right no matter what the problem is. We also give each customer our personal cell phone number and call the day of installation with follow up to make sure they are satisfied. I am very proud to be a member of there team the company ethics alone stand for themselves. 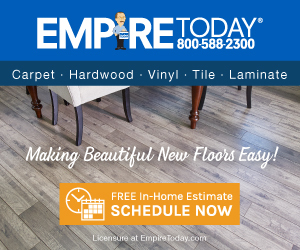 I have worked in the flooring industry over 24 years and Empire Today is one of the top customer service companies.